Over the past 20 years, kayaking has emerged as one of the most popular outdoor recreation activities in America. In response to this popular trend, 4-H camping programs have added this option to their recreation portfolios. Due to a shortage of certified instructors, many 4-H camps are teaching kayaking with lesser qualified staff. This presents concerns about participant safety, quality of learning, and user enjoyment. This fact sheet provides a stop-gap training option for creatively engaging participants in 4-H kayaking instruction. Why do youth enjoy kayaking? 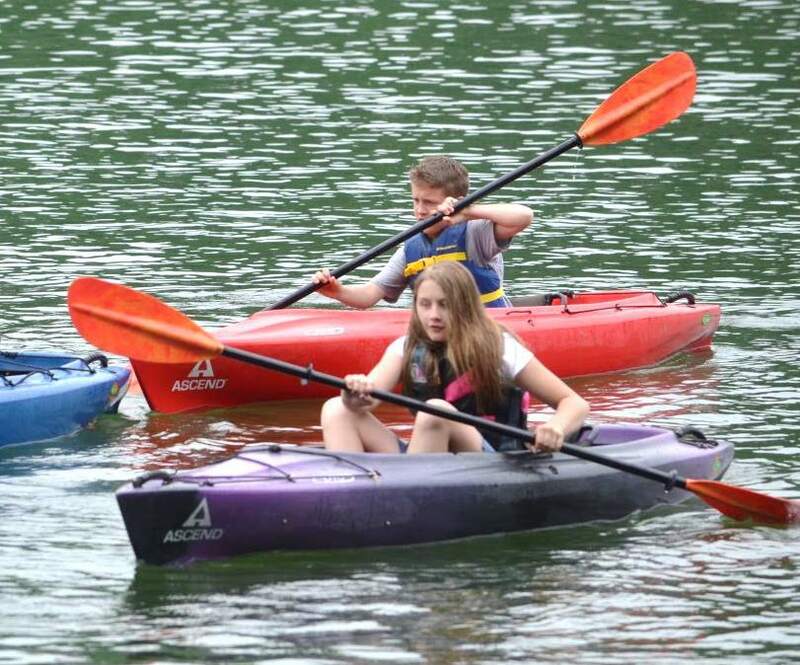 Research from Tanner and Strickler (2014) found that kayaking is one of the most favored activities at 4-H camps. Why do youth prefer it over other water-based activities like canoeing or fishing? The authors suggest that its individual nature and rapid skill gain lead to positive feelings among participants, especially given the limited time frames of typical 4-H camp sessions. Ever tuned in to popular outdoor TV channels or the Olympics to watch the kayaking competitions? If so, you’ve seen amazing drops, roll overs, and high-speed action as world-class kayakers traverse difficult whitewater conditions. And because this is what is shown on TV, campers fear their experience will be similar. For most, this is terrifying and they think they will drown. Verbally separating flatwater versus river kayaking is an important first act when training new kayakers. All participants should have on proper attire. A personal flotation device (PFD) is required; water viable clothing and footwear preferred. In most youth camp settings, lifeguard presence is required prior to entering the water. Follow best practices regarding thunderstorms. The opportunity for rapid skill gain and overcoming unwarranted fears makes kayaking an ideal positive youth development activity. Above, two youth take their tentative first strokes. When instructing participants, a minimum of 40 to 60 minutes should be planned. A sample breakdown of time for instruction follows. As the instructor, make sure you are properly dressed. This generally includes fast-dry clothing, skin protection, sunglasses, hat, and a properly fitting PFD. Industry standards suggest no more than a 1:5 instructor to camper ratio, so bring along a trained assistant or staff person for larger groups. Depending on your physical location, it may be beneficial to bring the kayaking equipment near the shore prior to camper arrival. To ensure campers get on the water efficiently, “speed without hurrying” through this section. Start by properly fitting a PFD for each camper. Any PFD rising above the ear lobes when pulled up from the collar needs a readjustment for a better fit. Once everyone is fitted, provide each camper with a kayak paddle. Ensure the paddles are adjusted to the offset position. Grip/hold. Both arms extended straight in front of your nose, paddle resting loosely in the V of each hand’s thumb crease, and lightly gripped. Forward stroke motion. With the convex portion of the paddle facing the front of the imaginary boat, the campers will keep their arms shoulder height and extended, and make back and forth paddling motions. Smooth over strength is the key. Urge them not to get lazy and “chicken wing” the motion as they tire. Reverse stroke motion. Same posture, but here they will twist their torsos, reach the paddle toward the back of the imaginary boat, and push forward back and forth on each side. Remind them to use their torsos not just their arms. This is also the time to train them to sit upright rather than slouching while on the water. Turning and stopping. Instead of pulling back alongside their bodies, they will paddle a wider arc several times on one side to make a turn. To stop, they merely need to stab the paddle into the “water” and push forward aggressively. To view videos of these actions, refer to Paddling TV (2016). One at a time, release the campers to the open water. While waiting for the class to gather in a central location, allow them to begin getting their feel for the various paddle strokes. Through mini-races and skill challenges, test the first four items covered in the On Shore section. After some free navigation and social time, have them draw close and conclude the class with a creative challenge (or two) that fits their median skill level! Flotilla—form a straight line of kayaks side by side. Train—form a straight line of kayaks end to end. Circle the Wagons—from the “train” the group will form an end-to-end circle; variation: after they are in perfect position ask them to paddle together while maintaining the circle…then reverse directions! Kolo—full details available from the author, but basically Kolo involves combining water polo and kayaking into a tremendously fun game for strong paddlers. Hand Race—a good concluding activity is to have campers stow their paddles and race back to shore using only their hands. This helps build balance skills and demonstrates just how beneficial smooth and efficient strokes are to the kayaking process. Returning to shore is dangerous if all the campers arrive at the same time. In particular, flailing paddles become troublesome in close quarters. Expert leaders are mindful of this phenomenon and will return the group to shore in a staggered manner (e.g., red boats go first, ladies go first). Rely on your assistant(s) to manage this chaotic process and ensure campers leave with a smile on their faces. Paddling TV (2016, June). Proper technique for paddling a kayak. Retrieved from youtube.com/watch?v=v0-efrwppWQ. Tanner, T & Strickler, J. (2014, September). Indoor vs. outdoor: What activities will convince today’s youth to get outside? Presentation at the 13th World Leisure Congress, Mobile, AL. American Canoe Association. (2005). Essentials of kayak touring. Birmingham, AL: Menasha Press. Dillon, P., & Oyen, P. (2009). Kayaking: Outdoor adventures. Champaign, IL: Human Kinetics.